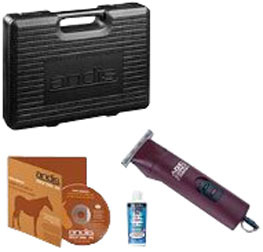 Equine Clippers, Pet Clippers: Andis, Oster, Wahl, Furzone! • ShowEdge Detachable Blade Equine and Livestock Clipper 3 pc. #768000: ShowEdge Equine and Livestock Clipper is an exclusive, angled clipper head offers improved access in tight spots. And it packs the same punch as larger, heavier clippers. The powerful, 2-speed rotary motor of the ShowEdge large animal clipper runs cooler and provides excellent results for competition cuts, shearing and all-around grooming. Detachable blade design for easy cleaning and greater usefulness from a wider range of blade choices. Tether cord offers extra security against accidental drops. ideal for goat, lamb, cattle and equine show grooming. Includes wide 3 inch ShowEdge general blade. 14 foot cord for longer reach. Rotary, 4400 Strokes per Minute, 120 Volts. Length 8.25 inch and Weighs 1.70 lbs. #78000. ORDER NOW! 120 Volts. Length 6.88 inch and Weighs 0.90 lbs. #21420. ORDER NOW! • EasyClip Whisper Adjustable Blade Clipper Kit 12 pc. #23585: Grooming dogs of all sizes at home. A lightweight and sturdy clipper for speedy detailing and styling. Designed for light body grooming, the blade adjusts from sizes 30-15-10. The quiet operation is more calming and comfortable for pets, leading to more relaxed grooming sessions. Includes 6 attachment combs sizes 1/16", 1/8", 1/4", 1/2", 3/4" and 1". Pivot, 3600 Strokes per Minute, 120 Volts. Length 6.13 inch and Weighs 0.80 lbs. #23585. ORDER NOW! reliable power. High-speed adjustable blade (30 to 9). 11 pc. ORDER NOW! Blade Guard, Blade Oil, and Storage Case. 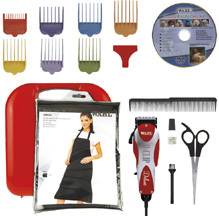 • Pro Animal Detachable Ceramic Blade Clipper Kit 9 pc. #21420: Powerful rotary motor clipper ideal for complete dog grooming wuth professional ceramic detachable blade. 3700 strokes per minute (spm) blade speed. Extremely quiet, powerful rotary motor is maintenance free. Break resistant housing, contoured to fit your hand. Designed and manufactured for years of reliable use. Ceramic Blades are detachable for ease of changing and cleaning --- choose from over 40 Andis Blades to maintain any coat length. . Ceramic blades stay sharper, longer and remain up to 75 cooler than steel blades! Works with all UltraEdge and CeramicEdge blades (sold separately) - the largest selection in the industry. Blades also compatible with Oster Model A-5 and most detachable-type clippers. 9 pc. #21420. ORDER NOW! INCLUDES: Rotary Motor Clipper, size 10 CeramicEdge blade, 4 attachment Combs: 1/8", 1/4", 3/8" and 1/2", Clipper Oil, Step-by-step instructions, and sturdy Carry Case. that prevents corrosion and you have cutting solutions that will last for years. 4-Piece Kit Includes: Clipper, Instructional video USB, Blade oil, and durable Hard Case. #22330. ORDER NOW! Length and weighs 0.80 lbs. ORDER NOW! 2-Piece Kit Includes: Clipper and CeramicEdge #10 blade. medium to small breeds. Measures 6.00 inch Length and weighs 0.60 lbs. ORDER NOW! 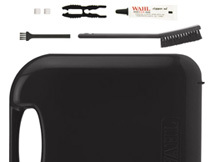 Blade Oil, Blade Brush, Step-by-step DVD, and Soft zippered case. both horse and groomer. • The adjustable precision blades offer a full range of grooming styles in cutting lengths of 30-15-10. Measures 7.00 inch Length and weighs 1.10 lbs. ORDER NOW! 3-Piece Kit includes: Clipper, Blade Oil, and protective Blade Guard. 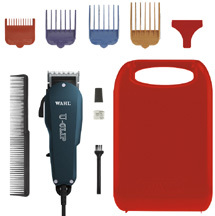 • Clipper Kit Easy Clip Adjustable Blade Multi-Style 11 pc. #18400: Perfect for all-around touch-ups on thin coats, and trimming face, ears and paws. Adjustable blade clipper is designed for light body grooming. • Blade adjusts from fine to coarse at the touch of the lever (sizes 30-15-10). Measures 6.75 inch Length and weighs 0.90 lbs. ORDER NOW! Blade Oil, protective Blade Guard, Brush, and Blade Oil. to longer (#10) bridle path/fetlock trims on the same blade. 7200 strokes per minute with 1 kgf-m torque. #PGR89EFX. ORDER NOW! 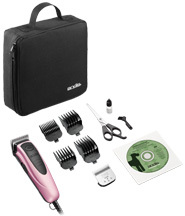 Kit includes: Scissors, Oil, 2 Combs, and Clipper-Comb Attachments, 9.5 ft. Cord and Carrying Case. • Clipper Major Red Equine Kit 3 pc. 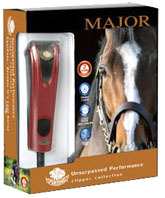 #610: Clipper Major Red Equine is with detachable blade clipper can do everything from trim work to body clipping on several medium coated horses. Major Clipper can easily do general trim work (bridle paths, fetlocks, face and ears) on multiple horses of most breeds. Powerful two-speed Major Clipper (2800-3500 spm) carries 6 kgf-m of torque. Included #10 Detachable Japanese steel blade is compatible with standard clippers of this design. #PGR89EFX. ORDER NOW! Kit includes: 100 cc bottle of Oil and Carrying Case. Clipper BearPet Kit 14 pc. 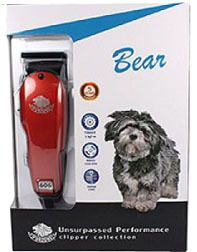 : Clipper Bear Red Pet is designed for general pet trimming. The 30-15-10 adjustable Japanese steel blade on the "Bear" allows you to go from close (#30) face, feet and ear trims to longer (#10) light-duty body trims on the same blade. 7200 strokes per minute, 1 kgf-m torque. • Clipper Bear Pet Kit RED 14 pc. #606: #PGR89EFX. ORDER NOW! • Clipper Bear Pet Kit BLUE 14 pc. #606:#PGR89EFX. ORDER NOW! Kit includes: Handy Carrying Case 2 Combs 2 Clips Scissors 6 Comb Adjustments (3mm, 6mm, 10mm, 13mm, 19mm, & 25mm) Blade Oil and Blade Brush. • Clipper Pepper Pet Kit PURPLE 10 pc. #910: Clipper Pepper Purple Pet is a cordless clipper with 2 nimh batteries which will clip for 60 minutes each. Unique, patented adjustable #9-10-30 Japanese steel blade is ideal for face and ear trims on multiple dogs (and cats!) of all breeds, and bridle path and fetlock work on multiple medium coated horses. It can also to trace clips on 1-3 medium coated horses. #PGR89EFX. ORDER NOW! Kit includes: Charging Stand (for clipper w/battery and extra battery), 5 attachments Combs (4mm, 8mm, 12mm, 16mm, 20mm), Heavy duty Carrying Case, Clipper Oil, and Blade Brush. 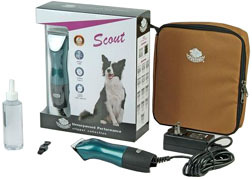 • Clipper Scout Pet Kit BLUE 3 pc. #322: Clipper Scout Blue Pet is a detachable blade clipper that can do general trimming (bridle paths, face & ears) on multiple dogs of all breeds. Special Japanese steel, detachable #10 blade is fine for all around duty. #PGR89EFX. ORDER NOW! 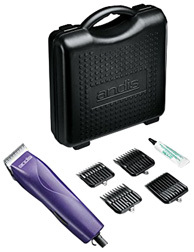 Kit includes: Flexi Groom Trimmer, 2 Comb Attachments, Lubricating Oil, Cleaning Brush, and Rechargeable Storage Base Unit. • Clipper Sarge Pet Kit BLUE 3 pc. 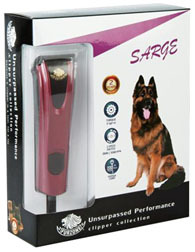 #610: Clipper Sarge Blue Pet with detachable blade clipper does everything from trim work to body clipping on multiple dogs. Exclusive #10 Detachable Japanese steel blade is compatible with standard clippers of this design. This powerful 2-speed clipper (2800-3500 spm) carries 6 kgf-m of torque. #PGR89EFX. ORDER NOW! 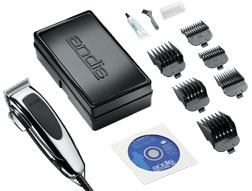 Kit includes: 9 Comb Set, Carrying Case, Blade Oil , 100 Cc and Blade Brush. 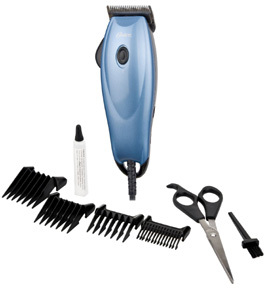 • A5 Turbo 2-Speed Professional Animal Clipper Blue 8 pc. #78705-100-000: A5 Turbo 2-Speed Professional Animal Clipper provides higher strokes per minute and wider blade sweeps for faster clipping for efficient and productive results. A5 Turbo 2-Speed Professional Animal Clipper glide through thick, coarse hair easily and function with less noise for a more pleasing grooming experience. 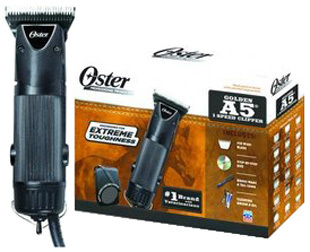 Turbo powered heavy-duty A5 Turbo 2-Speed Animal Clipper is perfect for any breed and all coat types. 3 Speed Settings: Hi 4400SPM / Lo 3600 SPM / Single 3100 SPM; compatible with all Oster A5 detachable blades. Made in USA. #078705-100-000. ORDER NOW! INCLUDES: Standard size 10 Wide Cryogen-X Blade, Mane & Tail Comb, Carbon Brushes, Blade Oil, & Cleaning Brush, Step by Step Instructional DVD, and Soft sided zippered carrying case. • A5 Golden Single Speed Clipper Black 10 pc. #78705-000-000: This amazingly multipurpose Golden A5 Single Speed Clipper with cooling face plate will make your job easier, handling everything from general purpose grooming to precision clipping, on any coat type. 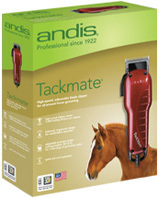 Perfect for equine trimming around mane, fetlocks and other tough areas to trim and clip. Efficient, quiet, dependable and cool-running, the Oster Golden A5 Single Speed Clipper provides the similar high-quality performance as the two-speed version and is compatible with A5® Cryogen-X blade, Elite Cryogen-X blade and the wider Take-Down-Quick wide blade series. 2100 spm. 12ft. cord. #78705-000-000. ORDER NOW! INCLUDES: Clipper, Standard Oster #10 Cryogen-X Blade, Blade Guard, Blade Oil, Cleaning Brush, Carbon Brushes, Extra Brush, Mane & Tail Comb, Step-by-step instructional DVD and Carrying Case. • A5 Golden Single Speed Clipper Electro Silver 9 pc. #78005-010-003: Unbreakable, powerful Golden A5 Single Speed Clipper Electro Silver provides smooth handling, quiet, and cool running for high-quality performance. to tackle any coat type. Golden A5 Single speed clipper manages everything from general purpose grooming to precision clipping. Powerful Universal Rotary Motor and Single speed clipper delivers up to 2,100 strokes per minute. Compatible with all OsterA5 detachable blades. #78005-010-003. ORDER NOW! INCLUDES: Clipper, Oster #10 Cryogen-X detachable Blade, Blade Guard, Blade Oil, Grease, Cleaning Brush, Extra Brush And Spring Set, and Instructions. • A6 Cool Comfort Heavy Duty Clipper Aqua Sky 5 pc. #78006-000-000: The Oster A6 Heavy Duty Clipper with compact ergonomic ZINC ALLOY technology delivers a high efficiency, lightweight ergonomic feel with heavy-duty, long-lasting durability. One hand operation switch with quick and easy selection of 3 speeds. The heavy duty motor that runs at over 4,000 SPM for a cooler running experience. Features a drive system to provide an ultra smooth and efficient cutting experience. Clipper Faceplate helps keep hair out while maintaining access to drive lever. Designed with VIBRATION ISOLATORS which are centered around the motor to help absorb vibration and noise, resulting added comfort for all-day grooming and minimizes hand fatigue. Takes all Oster A5 detachable blades. Weighing in at just 12.9 ozs, it's our lightest clipper yet. 12ft. power cord with space-saving extension. #78006-000-000. BLUE. ORDER NOW! INCLUDES: Clipper, #10 Blade, Cleaning Brush, Oil and Power Cord. • EasyClip Multi-Style Adjustable Blade Clipper Kit 10 pc./Purple: EasyClip Multi-Style Adjustable Blade Clipper Kit is perfect for touch-ups, this adjustable blade clipper is designed for light body grooming. Blade adjusts from sizes 30-15-10. Includes six attachment combs sizes 1/16", 1/8", 1/4", 3/8", 1/2" and 3/4". Rotary Motor 120V, 60Hz, max 7200SPM. 10 pc. #18400. PURPLE. ORDER NOW! INCLUDES: clipper, six attachment combs (1/16", 1/8", ¼", 3/8", ½" and ¾") stainless steel shears, blade cleaning brush, and lubricating blade oil. • Tackmate Adjustable Blade Equine Clipper/Metallic Red: Tackmate Adjustable Blade Equine Clipper is a high-speed, adjustable blade clipper for all-around horse grooming. Balanced, ergonomic, quiet, and cool operation delivers comfortable use for both horse and groomer. The adjustable precision blades present a full range of grooming styles in cutting lengths of 30-15-10. Hanger loop allows for easy and convenient storage. Includes lubricating blade oil and protective blade guard. Rotary Motor 120V, 60Hz, max 7200SPM. #66295. METALLIC RED. ORDER NOW! INCLUDES: Clipper, Blade oil , Blade brush, and Protective blade guard. • A5 Turbo 2 Speed Clipper Operation Home Front (Limited Edition) #78005-315-000: A5 Turbo 2 Speed Clipper Operation Home Front blends the power and performance with an well-designed custom flag pattern. Offers quicker and broader blade sweeps, with less noise during grooming for a effective and productive grooming result. Almost shatterproof, sturdy and resilient to clip, A5 Turbo 2 Speed Clipper glide through thick, coarse hair easily. It's detachable blade system offers remarkable flexibility. A5 Turbo 2 Speed Clipper is a heavy duty clipper delivers the toughest jobs with its impressive, quiet running and dependable motor. Universal Rotary Motor with 2 Speeds 3000 Strokes Per Minute Low 4000 Strokes Per Minute High. Includes #10 CryogenX Detachable blade. Compatible with all Oster A5 detachable blades. #78005-315-000. ORDER NOW! • Lucky Dog Clipper Kit: A single speed, lightweight, clipper that is easy to use featuring adjustable blade settings for coarse or light hair. 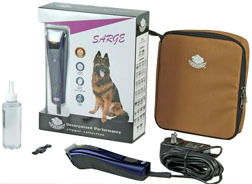 With 3,600 strokes per minute (spm) and a 8 foot cord, this clipper is perfect for do-it-yourself, at-home pet owner. 7 pc. #78960-000-000. ORDER NOW! Kit includes: Clipper, Grooming Shear, Cleaning Brush, Oil, and 4 safety Comb Attachments: ½", ¼", ⅛" and 1/16", a complete step-by-step Education Guide, and online access to videos. 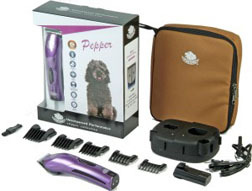 • Pet Performance Clipper Kit: Pet Performance Clipper is the absolute home clipping solution for at home clipping. Designed for dog owners for first time at-home grooming, the clipper presents a powerful pivot motor clipper which has twice the power of a traditional magnetic motor. 3600 strokes per minute (spm). 8 foot long cord. 11 pc. 78033-000-000. ORDER NOW! 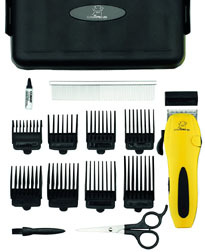 Kit includes: Guide Combs: 1/16", 1/8", 1/4", and 1/2", Zippered Storage Case, Grooming Shears, Cleaning Brush & Oil. Comes with a Step-By-Step Instructional DVD showing important safety tips, step by step instruction on how to clip the dog using a variety of breeds, and how to maintain the clipper. Lucky Dog Clipper Kit 7 pc. Pet Performance Clipper Kit 7 pc. CLIPPER: Lucky Dog Clipper Kit, 7 pc. CLIPPER: Pet Performance Clipper Kit, 7 pc. • Show Pro Plus Clipper Kit 10 pc. #9482-700: Show Pro Plus Clipper is ideal for clipping and trimming the bridle path, fetlocks, face, ears and all finish work. Helps accomplish fast, professional results at home. The Show Pro Plus was designed to be quick, reliable and quiet. Built to reach maximum performance when clipping and trimming it. Adjustable thumb taper lever easily adjust the blade to sizes #10-#15-#30 with the simple flip of the lever. Single speed with 7200 strokes per minute and has a 16 ft. Cord length. Measures 6.5 inches and weighs 16 oz. 10 pc. Made in USA. #9482-700. ORDER NOW! 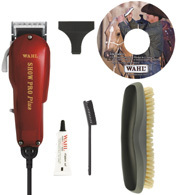 Kit includes: Multi-purpose Horse Clipper, Taper Control Blade (sizes #10-#15-#30), Face Brush, Blade Guard, Cleaning Brush, Blade Oil, Horse Grooming DVD, and Instruction Book. • Stable Pro Plus Clipper Kit 10 pc. #9774: Designed for ease, sturdiness, and long life, Stable Pro Plus Clipper delivers amazing power (3,200 SPM) to clip quick and efficiently. Cool running and lightweight, this single speed, rotary motor Stable Pro Plus Clipper features contoured and ridged finger grips for maximum comfort and control. With high stall torque for all coat types and for clipping the bridle path, fetlocks, face, ears and full body clipping. Suitable for all over grooming. Measures 6.5" and weighs 16 oz. 10 pc. Made in USA. #9774. ORDER NOW! Kit includes: Rotary Motor Animal Clipper, #10 Competition Series Blade, Drive Tip Removal Tool, 2 extra Replacement Drive Tips, Lid Removal Tool/Brush, Cleaning Brush, Blade Oil, Instructions, and Storage Case. 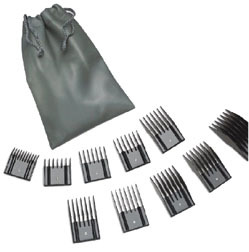 • Pro Ion Lithium Clipper Kit 10 pc. 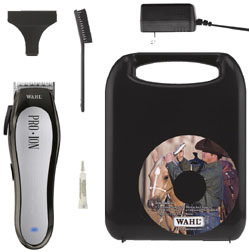 #9705-100: Lithium Ion battery power PRO ION Rechargeable Equine Clipper has new innovative Lithium Ion technology that offers optimal performance. Professional power up to 6,000 SPM and up to 2 hours of rechargeable runtime. High performance adjustable blade set easily adjusts to sizes #30-#15-#10. Measures 7.25 inches long, weighs 10.2 oz. Made in USA. 11 pc. #9705-100. ORDER NOW! Kit includes: Lithium Ion Clipper, Blade #30, #15, #10, Stainless Steel Scissors, Clipper Blade Guard, Cleaning Brush, Blade Oil, Hard Storage Case with Handle, Equine Grooming DVD. • Clipper Arco Kit Equine/Pet 14 pc. RADIANT PINK #8786-1201: Wahl's original '5 in 1' blade Arco clipper has remarkable power and unmatched cutting performance that allows professionals to quickly and efficiently clip through most coat types. Ideal for clipping the bridle path, ears, muzzle, and fetlocks. The extremely quiet clipper has low vibration and is exceptionally lightweight design fits comfortably in your hand while reducing wrist fatigue. Enjoy the 80 minute run time per battery and 75 minute charge time per battery gives you continuous cordless operation. The Arco kit contains 2 NiMH battery packs. 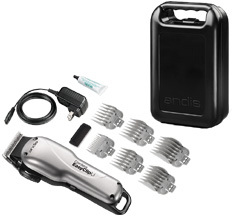 Easy-to-clean clipper with a no-maintenance motor for hassle-free grooming. Made in USA. ORDER NOW! • Clipper Iron Horse Plus 6 pc. #8582-100: Made in USA. 11 pc. #9705-100. 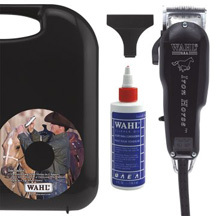 Wahl's Iron Horse Plus medium duty equine clipper kit is ideal for the bridle path, fetlocks, face, ears, light body clipping and finish work on all breeds of horses. Iron Horse Plus is built to accomplish optimum performance with an advanced, patented motor that offers plentiful power and speed without producing additional heat and noise. Designed for toughness with a practically indestructible impact resistant aluminum body. The easy to adjust #30-#15-#10 cut length thumb taper lever makes different cut lengths easy. Enjoy efficient cutting action while saving you the cost of 3 different blades. ORDER NOW! • Clipper Deluxe U Clip Pet Kit 17 pc. #9484-300: Deluxe U-Clip Medium Duty Home Grooming Kit contains everything you need to complete a professional-style clip from the comfort of your own home! Perfect for touch-ups between groomer visits, the Deluxe U-Clip is perfect for clipping paws, faces, and finishing touches – even light body clipping! – making clipping at home more convenient and enjoyable than ever before. Powerful at 7,200 strokes per minute makes clipping quick and easy. Easy-to-adjust cutting lengths of #30-#15-#10 for smooth, no-snag cutting. Made in USA. ORDER NOW! • Clipper U Clip Pet Kit 102 pc. #9484-400: U-Clip is ideal for keeping paws and faces clean between groomer visits. U-Clip Grooming Kit offers the at-home groomer with necessary tools for clipping and trimming all pet coat types easily and efficiently. The easy-to-adjust #30-#15-#10 cut length lever makes different cut lengths easy. Advanced, patented motor delivers increased power for efficient, professional-grade cutting action while saving the cost of 3 different blades. 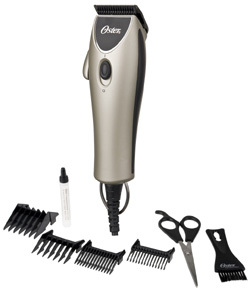 Powerful speeds up to 7,200 strokes per minute make clipping quick and easy. Made in USA. 11 pc. #9705-100. ORDER NOW! 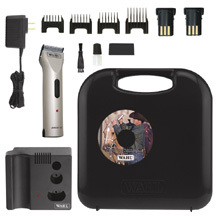 • Dog 2-in-1 Clipper/Trimmer Kit 16 pc. #PGRD420: Designed for both general clipping and trimming on all breeds. quiet, 120-volt rotary motor Clipper/Trimmer has turbo switch for 15% power boost. Features a 5-position, adjustable, detachable, ground steel diamond-sharpened blade for durability and cutting performance. 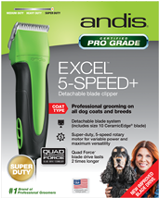 With an ergonomic rubberized non-slip grip for comfort and efficiency, Includes a special trimmer blade for trimming your pet's paws, face and ears. 16 pc. #PGRD420. ORDER NOW! Grooming Kit includes: Clipper/Trimmer, 8 Comb attachments, metal Comb, Scissors, Blade Guard, Lubricating Oil, Cleaning Brush, soft Storage Pouch, Instruction Booklet. • PRO Dog Cord/Cordless Pet Clipper Kit 16 pc. #PGRD500: Designed for general clipping. Features a powerful lightweight DC motor that produces 50% more power than a magnetic motor. Turbo button produces 15% additional power when pushed. Cord/cordless rechargeable with 35 minutes of run time on a full charge. Ground steel blade cuts easily through your pet's coat. 5 dent taper lever. #PGRD500. ORDER NOW! 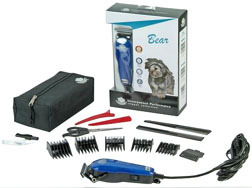 16-piece Pet Grooming Kit includes: DC motor Clipper, 8 Comb Attachments (45 settings combination), Metal Comb, Cleaning Brush, Scissors, Blade Guard, Lubricating Oil, deluxe hard Storage Case, Instruction booklet and DVD ("How to Groom Your Gog" by a professional groomer). • Dog Palm Pro Micro-Trimmer 6 pc. #PGRD44: Dog Palm Pro Micro-Trimmer is designed for trimming face, paws and ears. Ergonomic comfort grip, with easy-to-use trigger switch, allows Palm Pro Micro-Trimmer to fit snugly in your palm, out of animal's sight line. Cordless, battery-powered (AAA) trimmer runs quiet and smooth. Includes 2 Comb Attachments, Lubricating Oil, Cleaning Brush and 1 AAA Battery. #PGRD44. ORDER NOW! • ConairPRO Dog Home Grooming Kit 11 pc. 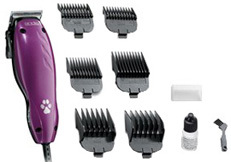 #PGRD240: ConairPRO Dog 11-Piece Home Grooming Kit is designed for all-purpose trimming and light clipping of your pet. Provides 5 adjustable cutting positions from long to short with locking detents and self-sharpening stainless steel blades for smooth, even cutting. Includes a special trimmer blade for trimming your pet's paws, face and ears. 11-Piece Home Grooming Kit includes 4 Comb Attachments, Comb, Blade Guard, Soft Storage Pouch, Instruction Booklet, Lubricating Oil and Cleaning Brush. #PGRD240. ORDER NOW! • Shed it Deluxe Deshedding Pet Grooming Kit 4 pc. 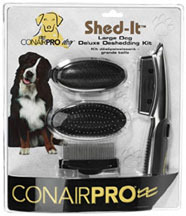 #PGRDDSKSM: ConairPRO Dog Shed-It is a de-shedding tool that is designed to remove excess fur, loose hair and undercoat. This tool is easy to use and can be used either left or right-handed. Deluxe Kit includes the 1.75" Shed-It with 3 brush attachments. #PGRDDSKSM. ORDER NOW!